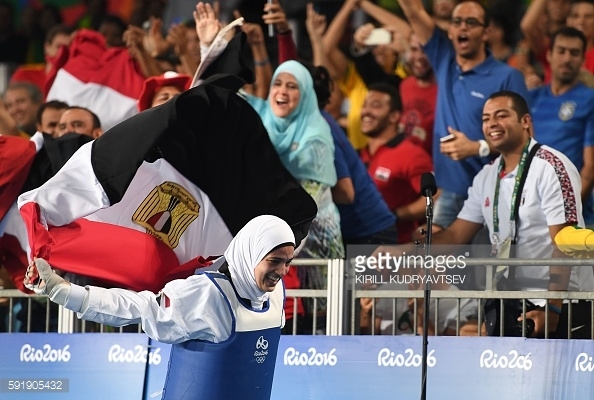 Egypt’s 23 year old Hedaya Malak clinched the bronze medal in the women’s Taekwondo –57kg event after beating Belgium’s Raheleh Asemani by the golden kick. Hedaya Malak’s run at Rio Olympics started off on Thu 18th of Aug as she defeated Patino Marin of Colombia 13-0 in the round 16, advancing to defeat World Champion Mayo Hama of Japan by the golden kick, 3-0, in the quarter finals. In the semis Hedaya lost to Elvo Calvo of Spain (0-1) – who then advanced to the finals yielding a Silver medal. This is Hedya’s second appearance at the Olympics, the first one was at the London 2012 Olympics at the age of 19, where she competed in the Taekwondo women’s 57 kg and qualified for the quarterfinals by defeating Robin Cheong of New Zealand in the round of 16. Hedaya Malak studied Fine Arts and is a graduate of Dar ElTarbia school. 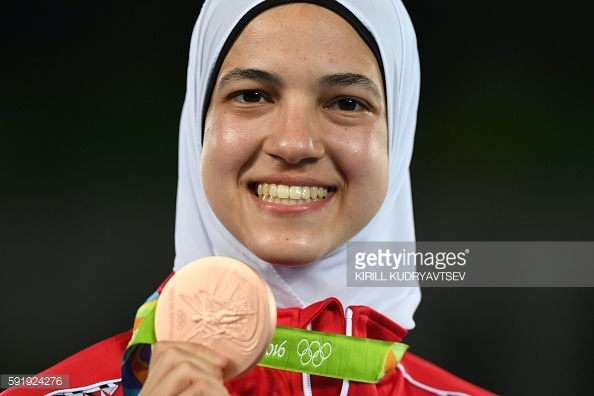 Hedaya Malak shared the podium with Iran’s Kimia Alizadeh Zenoorin, who also won the bronze medal ( the first Iranian woman to win an Olympic medal). The 18-year-old Iranian athlete beat Nikita Glasnovic of Sweden 5-1 after winning her repechage match with Thailand’s Phannapa Harnsujin 14-10. Fade Jones from the UK won the gold medal after she triumphed over Gomez 16-7. Previous articleScuba diving in Dahab: The Why and the How!